After the Camp Fire, residents of Paradise are not allowed to return. People who survived the deadliest and most destructive wildfire in California history were told this week that they cannot camp out or park RVs on their destroyed properties. They must keep waiting. The Camp Fire burned so hot and intense there is little remaining in the mountains near Concow, Calif. Residents would like to camp out on their properties, but the federal government says they have to wait until toxic debris is cleared. 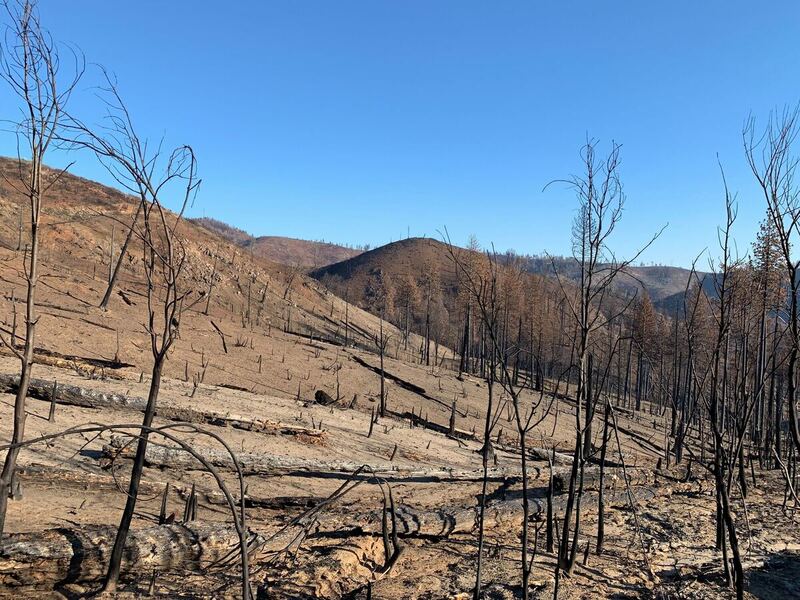 Three months have passed since the deadly Camp Fire devastated towns in the mountains of Butte County, Calif., leaving residents with burned-out properties covered with potentially toxic debris. In the mountain hamlet of Concow, one ridge over from Paradise, folks say they're used to wildfires and cleaning up after them. They load up a pickup a few times and haul the debris away to the dump. At least that's how they remember it being in 2008 after the last wildfire; but this time around, the clean-up process is not the same. The difference is the danger presented by the amount of debris after nearly 19,000 structures were reduced to ash by the Camp Fire. Disaster response officials on the ground say the daunting clean up is on a scale that this country has not dealt with since 9/11. Robert Anderson lost his home in last fall's Camp Fire, plus a couple of trailers and six cars. FEMA paid for a month in a hotel. Then, he was told by local officials he could come back and camp. But then this week, he learned he can't stay. "This is ... the worst — people that got their homes burned and lost everything that are going to be hit again," Anderson said. 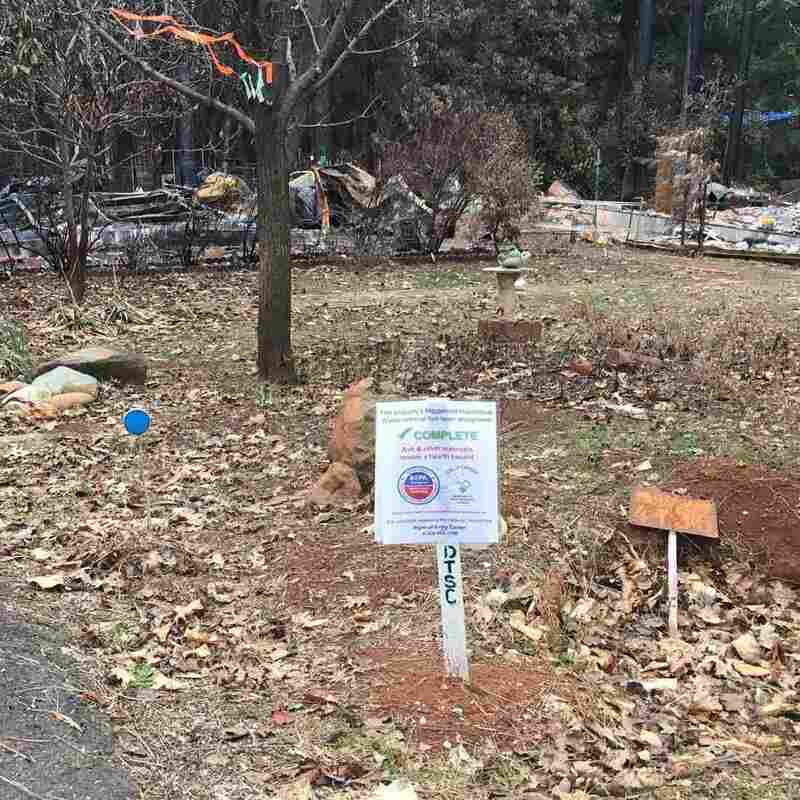 A sign marking a property in Paradise indicates that hazardous household items have been removed. But toxins in the ash and debris remain a concern. The latest hit is, in part, due to confusion. Health officials declared much of the burn area a public health emergency. Benzenes are seeping into the water. The rubble is a potentially dangerous mix of toxins that get stirred up every time the wind blows. But when you declare an area to be a public health emergency, the federal government says people can't live there. And the feds are the ones footing most of the estimated $1.7 billion for cleanup. "The county cares about their money rather than the welfare of the people. And that's the way politicians are, in my opinion," he said. 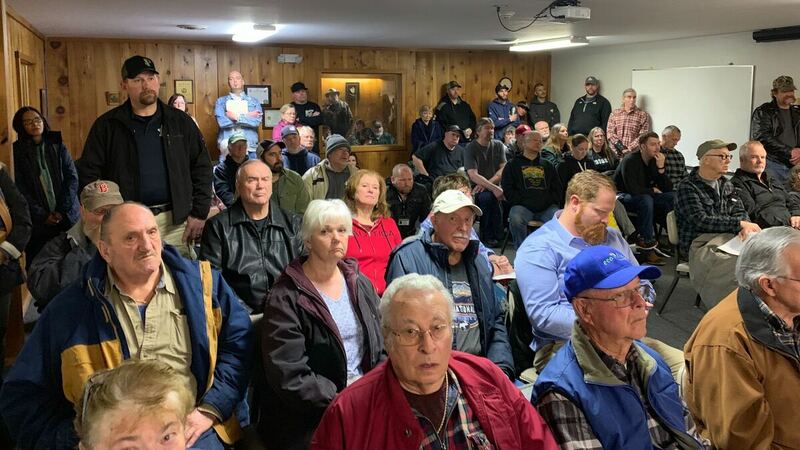 Residents of Paradise gathered recently at a town hall meeting to learn that they would not be allowed to camp out or park RVs on their properties until clean up was complete. The town is a "war zone"
Like a lot of rural areas, there was deep mistrust of the government here well before the Camp Fire, as well as conspiracy theorists. It all spilled over this week at a hearing in Paradise over the new camping ban. If we don't do it, our town will look like a war zone for the next 20 years because we are broke. Judy Jones, Mayor, Paradise, Calif. Some residents raised unfounded accusations that, by taking the federal money for cleanup, local officials would use eminent domain to build a fancier new town. Judy Jones, the mayor of Paradise, said the town doesn't have any choice: "Either we do this and get our town cleaned up, or we don't, and $1.7 billion to clean up the town goes away. We're not making the rules," Jones said. If they don't temporarily ban people from camping and the debris removal gets delayed, Jones said there are much bigger consequences. "If we don't do it, our town will look like a war zone for the next 20 years because we are broke," Jones said. The mayor isn't exaggerating. Paradise and the other destroyed communities around it really do still look like a war zone, even three months after the Camp Fire. And there's fear that more people will give up on rebuilding and leave the area altogether. "A lot of people aren't returning because of crap like that," said Martha Bryant,, who was born and raised in Paradise. "We've been through hell — absolute hell." Smoking a cigarette to calm her nerves, she said people here should be left to make their own choices. "It's their property. They're adults. They know the risks. We don't need other people — the county and everybody else — telling us how we should live our lives," she said. FEMA said they're committed to getting the cleanup done as quickly and safely as possible. But the monumental debris removal from almost 19,000 destroyed structures is estimated to take at least a year. There still are folks who are committed to sticking it out. Karen Roberds lost her home, cars and prized motorcycles. "We bought up here in 2002, and so it's our home. It's our retirement. It's our community," Roberds said. She said people came up here to escape the city, and these mountain communities should and will rebuild. "This is what I want to grow old knowing — that I helped put this back together," Roberds said. The new temporary ban on camping on burnt out properties isn't popular. But not everyone is fighting it so vocally. One ridge over from Paradise, rural Concow hasn't gotten as much media attention. It's a lot smaller but, three months after the Camp Fire, the scale of the destruction here is still a shock to see. Down a dirt driveway, Chuck Huff and his son were picking up blackened sticks and burnt brush, throwing them into a pile. Friendly and soft spoken, wearing a ball cap for shade while he works, Huff is the main caregiver for his 19 year old son, Casey, who's developmentally disabled. 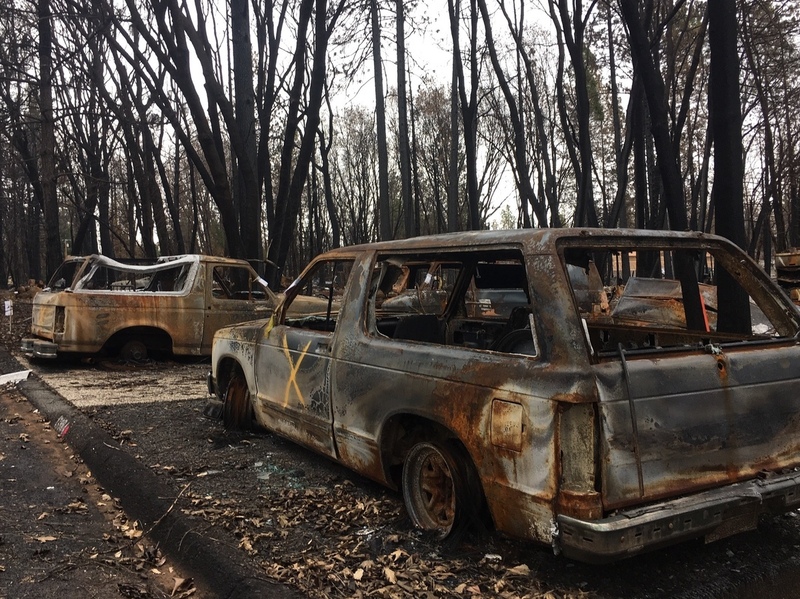 Many of the lots in the burned out towns above Chico still have the charred remains of cars that need to be cleared out. "Basically we're cleaning brush," he explained. "It's burnt down. We lived through the 2008 fires and we didn't realize how quick brush is going to grow and overtake." Huff wiped the sweat off his forehead and turned to look at what's left of his fathers's home on the hill above. "Basically right up there where the suburban is, their place burned down in 2008. They had a new mobile home put in." When the Camp Fire roared through last November, Huff's elderly father couldn't get out. "It burnt down again. And unfortunately my father burnt with it," said Huff. The home that he and his wife and son lived in over in Paradise also burned to the ground in November. Their story is just one of many harrowing stories of victims in this huge disaster. It seems unfair. "Obviously with my disabled son, his structure being turned upside down, or lack of structure," explained Huff. "Just affects everyone in our family." But Huff and his family are not leaving these mountains. His wife is back at work at a local school. And they're not afraid of eventually rebuilding in a high risk area like this. "No, that's part of life. We will definitely be way more prepared than before, the previous two times," he said. He says this is home, where the memories are: "it was our life, it was the center of our family." The Huffs had applied for a permit to camp out here on their five acres while they wait to rebuild, but were notified they can't now, at least until the government has cleaned up the site and certified it as safe. It was another setback. For now they'll have to keep living where they've lived the past three long months — in a camper in his sister's driveway down in Chico. Huff doesn't blame anyone, he tries to shrug it off as he gets back to clearing all the brush off his parents' charred lot.